Implementing a real world mechanic is hard for many designers because they are too tempted to keep too much of the real world in their board game. When designing, I preserve the experience of the mechanic in the real world, even though I do not always preserve the theme. In the real world, that mechanic is part of a larger more complicated system that can be too complicated to implement in a board game. When I implement a real word mechanic there is a particular aspect of the mechanic I want players to experience. The first step to utilizing a Real World Meachic is to distill the mechanics down to most basic components and purpose. This simplicity focuses in on the fun in the singular real world mechanic. Stock is a form of cooperation. Stock enables people to form partnerships that divide ownership within something that they can easily trade. 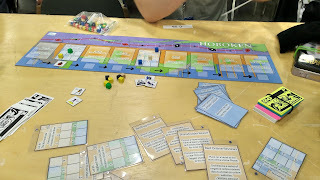 Stock is also part of a larger financial system that interacts with banks, bounds, hedge funds, etc that complicates what stocks can do and is not part of the experience of stocks I want to partake in my board game design of Hoboken. Hoboken is about the experience of using stock to work together in a competitive environment. In Hoboken players are hotel operators trying to build new developments along the waterfront of Hoboken. No single player has the cash on hand to construct these hotels and no means of obtaining new cash until a hotel has been built. The only way to get a hotel constructed is by forming partnerships with other players, splitting ownership and the potential income in future turns. 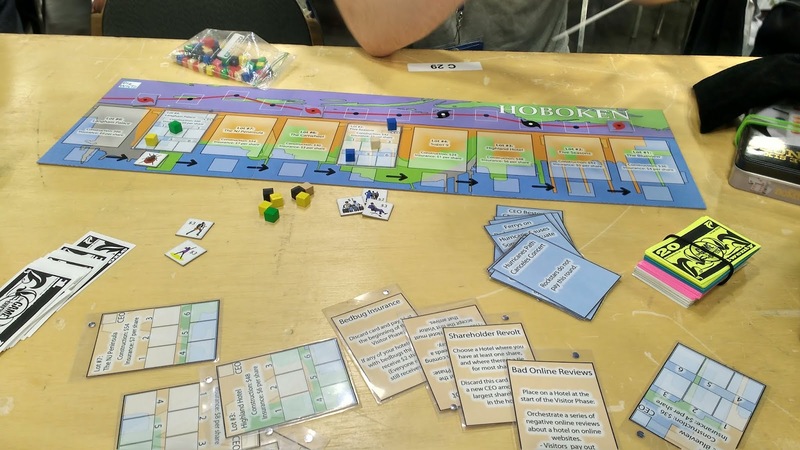 By removing many other means of raising capital investment found in the real world, players in Hoboken focus on the fun of negotiating the price of a share, deciding how to divy up ownership in a new construction, and who they want to form partnerships with to build their real estate empire. Players are not sidetracked from the core real world mechanic by unnecessary themes or actions. I like the idea of thinking of a stock mechanic as a cooperation mechanic. I really need to pay more attention in different games I play that have stock mechanics to see if that comes through every time. We are the game designing team Aaron and Austin. Click on the links bellow to follow @drwictz on twitter or to find the Dr.Wictz facebook page. What To Ask On a Blind Play Tester Feedback Form? Prototype Question: Should I include money with my board game prototype? Copyright Dr. Wictz. Watermark theme. Powered by Blogger.